Thousands of Tibetan mastiffs have been abandoned due to a decline in their price in Northwest China's Qinghai Province and Southwest China's Tibet Autonomous Region, threatening local residents' safety and creating challenges for local animal shelters to accommodate them. Breeders who wanted to make a fortune in the Tibetan mastiff market abandoned their dogs, which left thousands of dogs wandering around temples and villages, attacking people and killing livestock, a WeChat public account "shenyidu" of the Beijing Youth Daily, reported on Wednesday. Tibetan mastiff as well as its hybrid have lost popularity as more cities have banned large breed dogs, Jiang Hong, head of a Xi'an-based animal protection group who has paid attention to the homeless dogs in Tibet and Qinghai since 2012, told the Global Times. Many cities, including Beijing and Shanghai, have banned citizens from having dogs with the height of 35 centimeters or above. An anonymous Beijing-based dog seller told the Global Times on Wednesday that the price of Tibetan mastiff has dropped sharply recently. "A dog [Tibetan mastiff] with excellent appearance could be sold at 3 million yuan ($457,700) at the peak time. But the average price now is between 3,000 yuan and 30,000 yuan," she said. 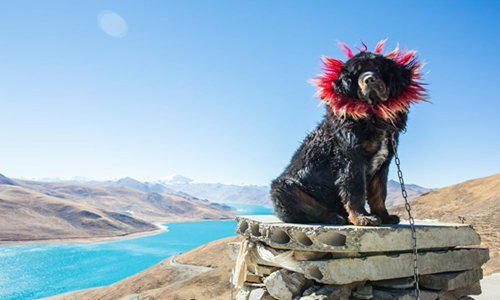 Statistics from a Qinghai-based environmental protection organization showed that the number of homeless canines has increased sharply in 2013 when the Tibetan mastiff lost its market value. "The sharp decline in the price is one reason behind the rise in homeless Tibetan dogs, and the other is their strong fertility. Some local governments built a shelter to cage thousands of Tibetan dogs but after a few months, the number of dogs increased," Jiang said. These Tibetan dogs would threaten local residents' safety as these dogs have not been vaccinated and they would also attack other animals in the areas, including snow leopard, which has been listed as a protected animal, Jiang said. Data from the Center for Disease Control and Prevention in Tibet showed that an average of 180 people have been attacked by homeless dogs per month, read the report of "shenyidu." And statistics from Lhasa, capital of Tibet, showed that the total number of homeless dogs in the city reached 13,000 in 2015. The local government in Yushu Tibetan Autonomous Prefecture in Qinghai and a temple jointly spent 400,000 yuan on building a shelter for 1,200 homeless Tibetan dogs, and conducted sterilizing operation on all female dogs to prevent fertility, said the "shenyidu" report. Dog shelters in these regions face financial and management difficulties since it costs much to raise Tibetan dogs, Jiang said, adding that local governments and animal protection organizations should join hands in dealing with the issue, including discussing the possibility of mercy killing of the untamed dogs.